Right now, video is the most important and effective way for a business to establish trust with customers on social media. Why is that? 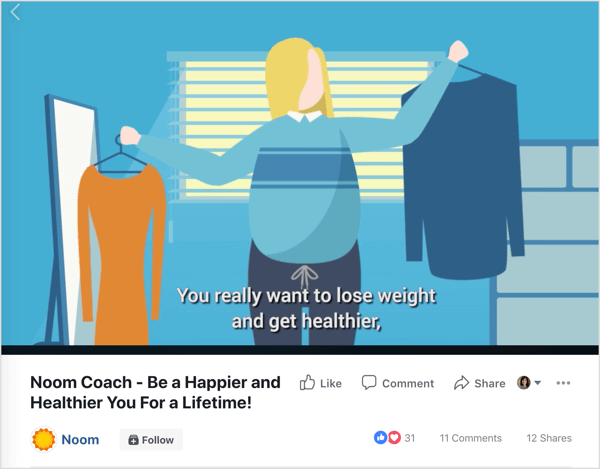 Because customers use the story that’s being told in your video to learn more about who you are and what you’re about, to emotionally connect with you, and to preview products they might purchase. So it makes good business sense to treat your video content as the valuable marketing asset it is and distribute and promote each video in a way that best places it to do its job for you. Worried a comprehensive video distribution plan will take too much time? Don’t be. Rather than forcing yourself to create multiple pieces of new content for different platforms every single day, this plan lets you produce one piece of quality content every week and then distribute it to multiple platforms in a way that makes sense for each platform. For example, if you do a video interview, you could publish the video to YouTube and the audio to your podcast. Before you can effectively publish, distribute, and promote your videos, you need to have a business blog on your website and a Facebook, YouTube, and Instagram presence for your business. Why these platforms? 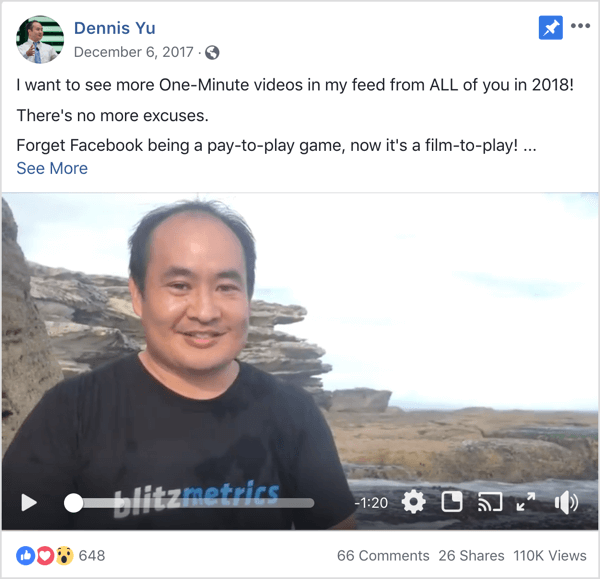 Facebook has over 2 billion active users, and while there are 50 million businesses on Facebook, only a small fraction of those businesses are doing anything with video. Again, the opportunity for you to connect with your ideal customer is high. And while only about one-third of native news feed video is watched on average, the average watch time for a Facebook Live video is 34.5 minutes. YouTube has over 1.9 billion monthly active users and is the second largest search engine after Google. Of course, Google owns YouTube so they kind of work hand in hand, a partnership you’re going to take advantage of. Because only 9% of small businesses are on YouTube, the opportunity for you to connect with your ideal customer is high. As a side benefit, when you build your viewership and subscriber base, you can take advantage of multiple monetization options. Sponsored Instagram videos generate three times more comments than sponsored Instagram photos. And 35% of Instagram users post and view Instagram stories. In fact, Generation Z and Millennials are actively seeking Instagram stories about the products and services they’re considering buying. These data points make Instagram an integral part of this strategy. Websites with a blog have 434% more pages indexed by search engines (Google, Bing, Yahoo) than websites without a blog, and blog posts that incorporate video attract 3x as many inbound links as blog posts without video. 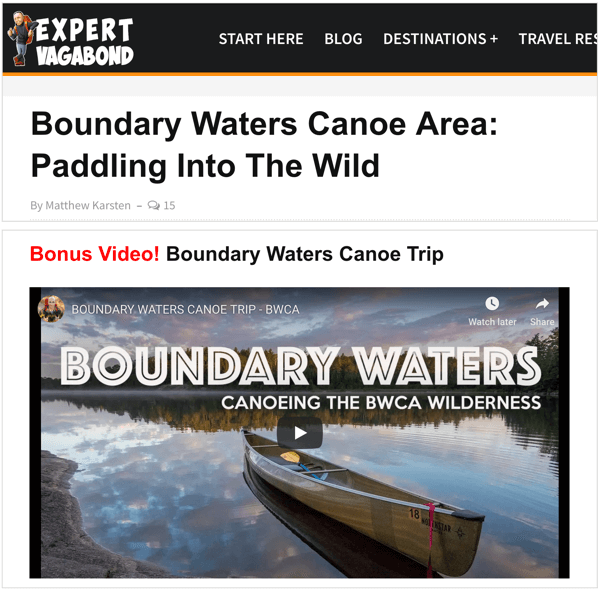 When you embed YouTube video in a blog post, as Expert Vagabond does below, you also increase the blog post’s searchability, retainability, and watch time. The average user spends 88% more time on a website with video. Eighty percent of podcast listeners consume at least seven shows per week, and more often than not, they listen to the entire episode. Do your current and potential clients most often consume your content and convert on YouTube or Facebook? The answer will tell you which platform should be the dedicated home base for your new video content. My number-one platform is YouTube, so this article will focus on driving traffic back there. Publish YouTube video to Facebook (and an optional podcast platform). Publish Facebook video to YouTube (and an optional podcast platform). 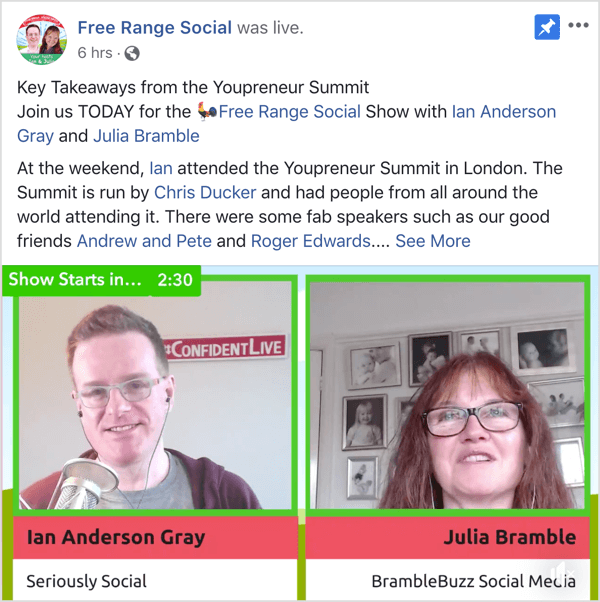 Publish Facebook Live video to the Facebook news feed and YouTube (and an optional podcast platform). To visualize this, the Business of Video Podcast is actually recorded as a Facebook Live broadcast. After the Facebook Live recording, a version of the video is loaded to their YouTube channel. If you don’t have a copy of your original video handy, you can download it directly from YouTube or Facebook. When you cross-publish your video, make sure you optimize the titles, descriptions, and other components for SEO purposes. Pro Tip: Keep in mind that 85% of people who watch video on Facebook watch it without sound. Be sure to add captions to your social media videos so viewers don’t have to rely on sound to understand your video. Next, create a dedicated blog post in which you embed your YouTube video. In the body of the post, add your show notes. Show notes can be an abbreviated recap or an extended article that covers the video’s topic in detail. Whichever you choose, remember that the goal is to create a post that’s optimized for search. Use proper keywords, stay relevant to the topic at hand, and include links to a few related videos. 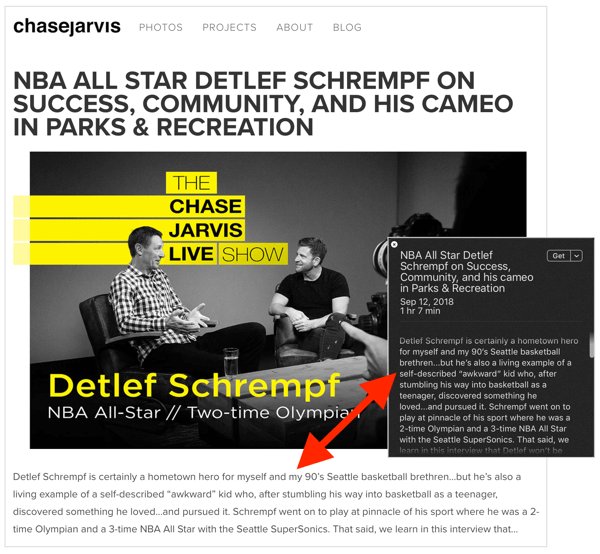 Pro Tip: If you decide to extend your cross-publication to a podcast, you can use the same text from your blog post for the podcast show notes, as photographer Chase Jarvis does here. After you’ve written your blog post and embedded your video from YouTube into it, create teasers to drive traffic back to the original video content. This strategy utilizes three types of short video teasers you can create from your full video footage. You’ll share each of these clips on their respective platforms after your blog post and video are published. Be sure to include a link back to the full video on your primary platform. Create 60-second promo clips in a square format for your Facebook and Instagram feeds. Deliver a story that combines a clip from your video with a strong call to action to prompt people to swipe up and watch the full version of the video. Amy Landino does this well at AmyTV where she has used YouTube to become the vlog boss. 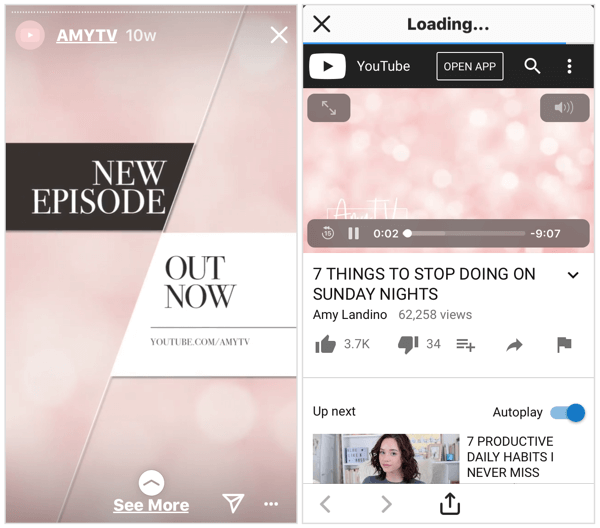 She creates these beautiful videos twice a week for her Instagram stories that help promote the full AmyTV episodes. 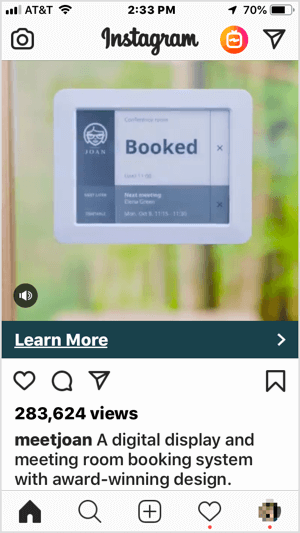 They’re not only branded and give viewers a teaser of what the topic is, but they also have a call to action to get people to swipe up. You’ll find these on her Instagram stories after she posts a new episode. Create a short clip that combines background images and video with text from your blog post. 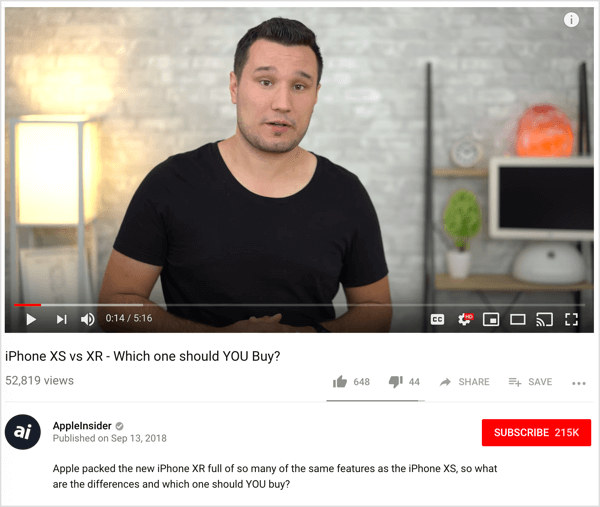 Regardless of whether your video is brand new or evergreen, you want people to continue to watch it, so you need a way to drive traffic back there every chance you get. Here’s how you can continue to keep those videos alive on a long-term basis. Over time, you can pay to serve your captioned video to different Facebook audiences to reach future prospects. This video from Dennis Yu is a year old and he’s still able to use it. Pinterest is an often undervalued, underutilized search engine that hundreds of millions of people use to find ideas, inspiration, products, and content. Be sure to use a horizontal pin image (600 pixels x 900 pixels) and upload it natively to Pinterest with a backlink to the blog post for your video. If you’re a WordPress user, you can use the Revive Old Posts plugin to automatically send a series of tweets about every blog post you publish—for as long as you choose, as often as you choose. I estimate that 25% of traffic to my old blog posts comes from using this tool. Rather than focus on the quantity of videos you create, concentrate on producing one piece of quality video content every week and then distribute it to multiple platforms. You can turn one video into long-form, scrollable, audible, searchable, and promotable content. This allows you to increase your visibility on social media and tap into a long-term search strategy with evergreen content. What do you think? Do you distribute your videos to multiple channels? Have any tips to get more mileage from your videos? Do you use promo clips to drive traffic to your original video content? Please share your thoughts in the comments below.